Britain's most dangerous roads revealed | What Car? Half of the fatal road accidents in the UK's happen on just 10% of the country's roads, according to a report from the Road Safety Foundation. 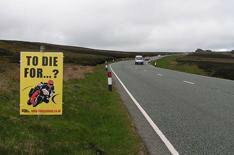 The study, which examined 28,000 of the UK's A-roads and motorways, revealed that Scotland's roads pose the greatest risk of death and injury, with highways in northern England coming second for risk. Britain's most-dangerous road was once again revealed as the Cat and Fiddle Pass section of the A537 between Macclesfield and Buxton in Cheshire. The Road Safety Foundation, the British arm of the sister organisation of EuroNCAP, wants Government money to be targeted at specific areas of road safety to help reduce deaths and injuries. It believes many lives and the resulting costs could be saved by spending relatively small amount of cash on accident blackspots. The report also revealed that many roads have become safer. The A40 between Llandovery and Camarthen in Wales was the most improved section of highway. Improvements to the road, such as better junctions and resurfacing with anti-skid treatments, contributed to a reduction in serious accidents from 27 between 2003 and 2005 to just seven for the subsequent three-year period. Dr Joanne Hill, the Road Safety Foundation's director, said: 'Not only can Britain reduce road deaths and serious injuries but, by targeting a relatively small mileage of high-risk roads, we can do so with good economic returns. The following lists the UK's most-dangerous roads with statistics for crashes involving motorcyclists removed.